Environmentally low-impact though this house by Berg Design may be it is certainly a visually high-impact structure, filled with dynamic modern lines and contrasting contemporary materials that make quite a statement against its naturalistic surroundings. 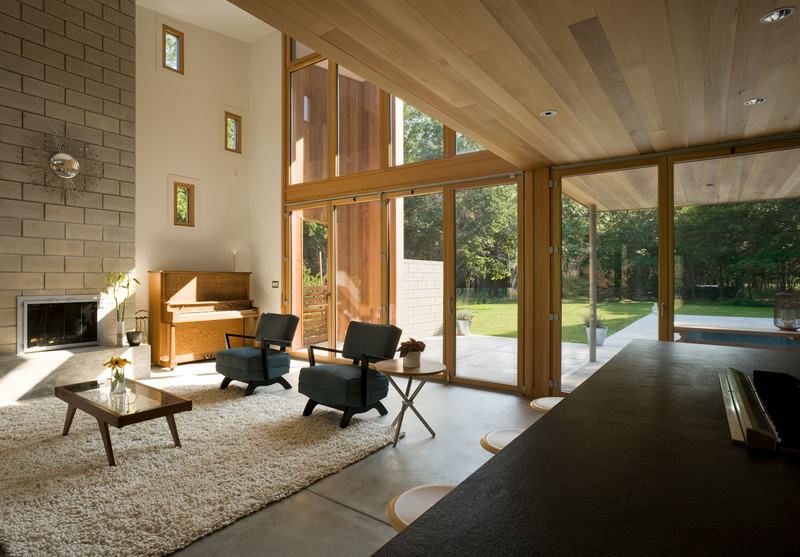 Completed in 2007 in East Hampton, New York, “Old Stone Highway” is a gorgeous example of modern sustainable architecture, particularly in its use of visually complementary natural materials. 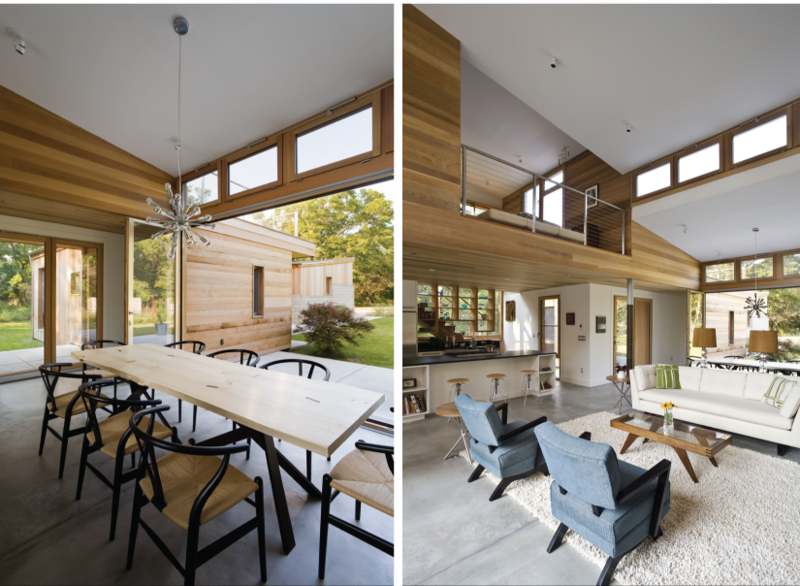 Though you might not guess it at first glance, this house design was inspired by regional vernacular agricultural architecture – a modern reinterpretation of a local building typology, only much more contemporary and eco-friendly in its construction. 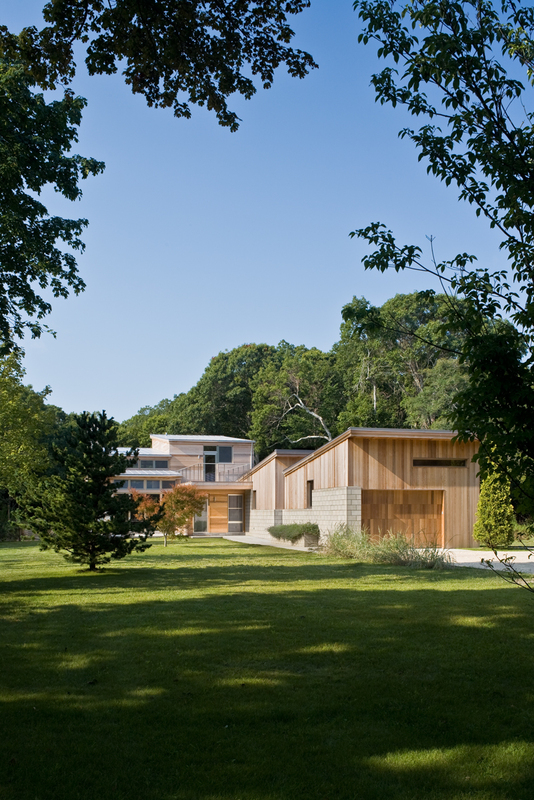 Architect John Berg says he was inspired by a barn on Long Island that he spent many summers around as a child. Green materials, systems and strategies include: radiant heat and geothermal cooling, heat-resistant exterior finishes and glass, ideal solar orientations, sustainable wood siding, energy star appliances, dual-flush toilets and vintage furniture and furnishings. Structural insulated panels (SIPs) create a highly efficient building envelope and the roof features a non-heat-absorbing finish. It was also designed with passive solar principles in mind, calculated to minimize solar gain in the summer so it stays cooler naturally. 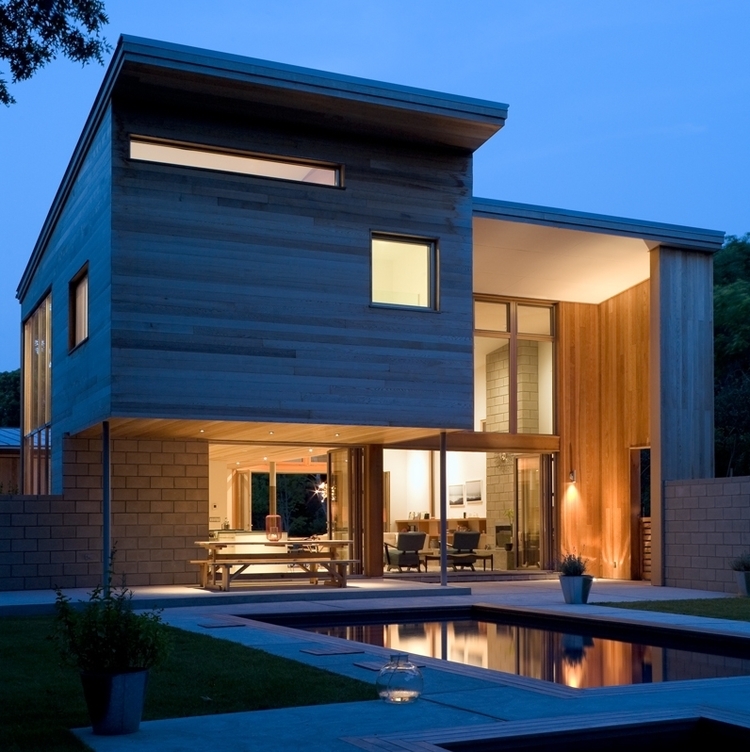 “Drawing its inspiration from a barn built in the 1800’s, the Old Stone Highway house is conceived as a modern interpretation of the Long Island agricultural vernacular while also incorporating the use of environmentally low impact building technology,” says Berg of the design.